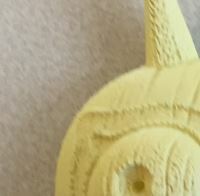 As we reported earlier, Annabel Berens was the lucky winner of a 3D print of her own choice. This prize she won thanks to her impressive hulahoop picture she posted with #ShakeYourRompa on our Facebook page during SunGrooves festival (29-08-2015). Once more congratulations Annabel! "Thank you! It really came as a surprise. 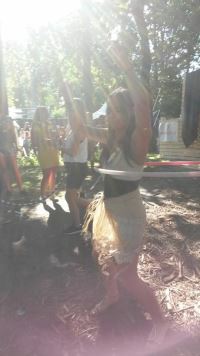 Everyone was quite busy hulahooping during SunGrooves and taking pictures. I did not think my picture might stand a chance. So thay I've won is super!" Annbel (25) visited the small dance festival in Ravenstein together with her boyfriend for the first time. Next to the "Shake Your Rompa" stage, which was sponsored by Rompa Group, was a large mountain of hulahoops. "And yes, of course you have to practice your hulahoop moves when you see thay ... My boyfriend took a picture of me which we posted on Rompa's Facebook page. A few days later I saw on Facebook that I had won! That was of course a beautiful surprise after a well-organized and great party." Annabel contacted our colleague Marc Ouwens (product design). "Quite difficult to make a choice as there were so many possibilities, but in the end I picked a Majora mask. This is a character from "Legend of Zelda", a Nintendo game. Yes, my friend and I do love gaming." Earlier this week Annabel came to pick up her mask at our office in Tilburg. Majora still looks a little pale, but "no worries, because I'm going to paint the mask. Before that, I will ask Marc for some advice about what kind of paint can I use best. And when it is finished? Then it will be hung on the wall in my living room, next to all the other fun items that my boyfriend and I gather" said Annabel.